New Ticket Note - Triggers when a note is added to a Ticket. New Ticket - Triggers when there is a new ticket is created in Freshdesk. Update Ticket - Triggers when a ticket is updated. Delete Ticket - Triggers when a ticket is deleted. Restore Ticket - Triggers when a ticket is restored. Update Contact - Triggers when a contact is updated. Delete Contact - Triggers when a contact is deleted. Restore Contact - Triggers when a contact is restored. Go to the Flock App Store and install the Freshdesk app. 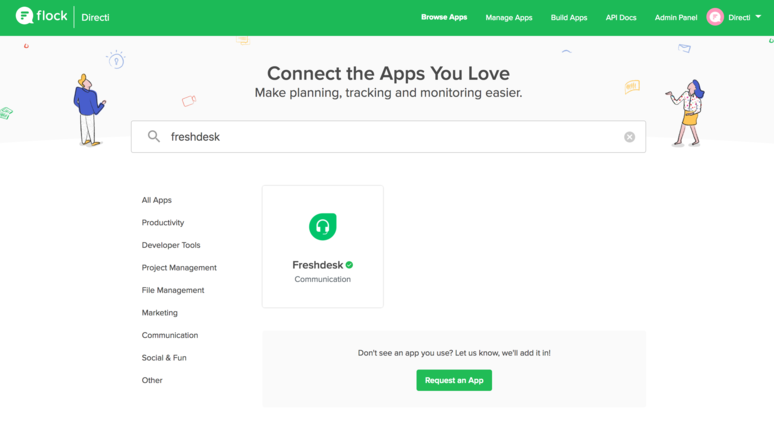 - Click the Install button to go to the Freshdesk Marketplace and install the Flock app. - Note down your team’s Freshdesk URL. - E.g. alphacorp.freshdesk.com, without a http:// or https:// prefix. 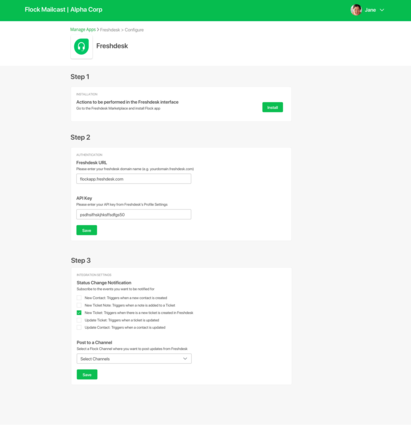 - Copy your Freshdesk API Key. - You can find this in Profile Settings on Freshdesk. - Come back to Flock’s Manage Apps page to configure the integration. 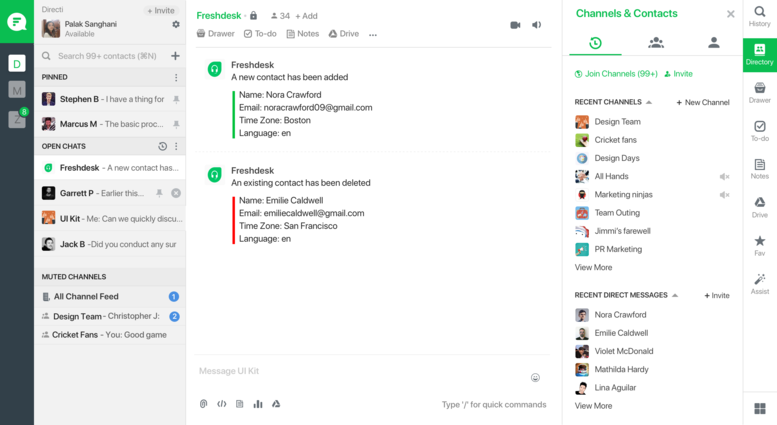 - Enter your team’s Freshdesk URL and your API Key. - Click Save and scroll down to the next screen. - Select the activities you want to be notified about. - Select the channel you want to be notified in, and click Save. And you’re done! 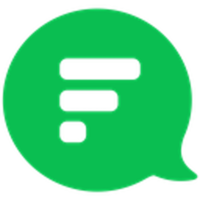 Within seconds, you’ll start receiving notifications in Flock about support activities in Freshdesk. Click on a notification to access the contact/ticket in Freshdesk. Additional Notes: You can add multiple configurations to the Freshdesk app to monitor multiple dashboards.